Texas senator Ted Cruzs incendiary rebuke of Republican presidential nominee Donald Trump on the stage in Quicken Loans Arena on Wednesday evening seemingly transformed the home of the Cleveland Cavaliers basketball team into a gladiatorial colosseum, complete with screaming fans and enraged detractors. But the greatest battle on the stage during the week of the Republican national convention may be for control of a different kind of stadium entirely: its Pokmon Go gym. The mobile phone game, which integrates the hunt for fictional cartoon monsters with real-world locations in which users can battle one anothers teams, has become hugely popular at the RNC, where cellphones are ubiquitous and the downtime can be lengthy and tedious. Its popularity among journalists at the convention has been particularly pronounced. There are three PokStops (check-in spots wherein trainers can obtain supplies) at the Huntington Convention Center alone, each of which is almost constantly installed with a lure, which draws Pokmon to the area. In the vast scheduling gaps between speeches, votes and briefings, pairs of reporters are frequently seen roaming the vast convention center in search of rare Pokmon. One Fox News Channel producer, seen wandering in haphazard concentric circles in the lawn outside the convention center, said he was more excited for Clevelands Pokmon offerings than the convention itself. Drowzees are like Pidgeys here, the producer, who declined to give his name out of minor embarrassment, said. He was referring to a sleepy tapir-style Pokmon and a near-ubiquitous pigeon-esque Pokmon, respectively. My girlfriend is so mad Ive been sending her screenshots of my Pokdex every time I catch a new one. The game isnt popular with every RNC attendee, however. As Utah waited to cast its vote during the roll call on Monday night, Senator Mike Lee, a steadfast opponent of Donald Trump who has yet to endorse the nominee, declared that he was not a fan. The bottom line is, it is not a fun game, Lee said. There is nothing about Pokmon Go I find enjoyable. Lee then took out his phone to try to elaborate on this theory, but the GPS didnt work on the packed convention floor. With the epic taxonomy of Pokmon, some users have noticed that certain Pokmon share more than passing resemblances to famous political figures. An anti-Westboro Baptist church protester in Clevelands Public Square named Kris Steadman, noticing this reporters buffering Pokmon Go screen, observed that Donald Trumps hair looks like a sad Flareon. In my Pokdex, a freshly caught Jynx, a Pokmon with pouty lips and stringy blonde hair, is nicknamed Ann Coulter. 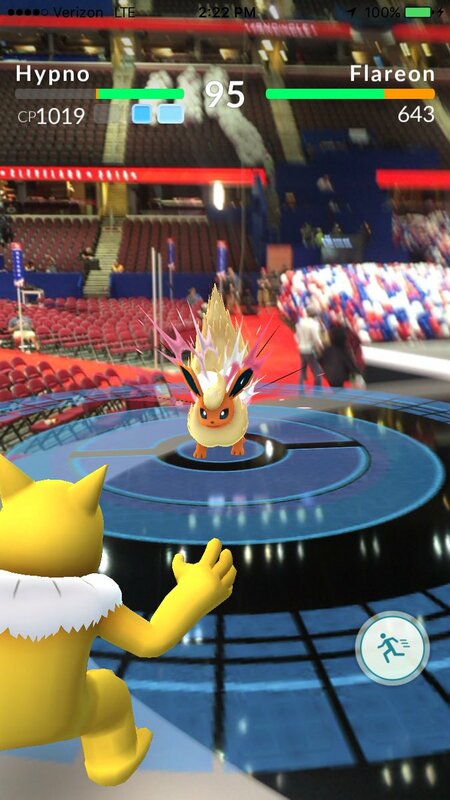 Pokmon Go, like the Republican national convention, is a masterwork of augmented reality. The source of the games rapid popularity two weeks after its launch, Pokmon Go has more users than Twitter is its incorporation of a real-world environment augmented by computer-generated gewgaws. Some attendees of the RNC, spotted idly swiping their phones during keynote speeches, see the game as having political applications. They should put rare Pokmon in poor areas, Jordan Brewer, a volunteer at the RNC from Mississippi, said. Its social entrepreneurship! People would come to poor, rural areas to catch, like, a Dragonite, and then stay and spend money. Perhaps ironically, few Pokmon Go players the Guardian spoke to had engaged in many battles, even at the now-storied Quicken Loans Arena stage Pokmon gym. Theres basically no point in fighting someone with that level of obsession, the correspondent continued. Like, let the baby have his bottle. He caught himself and laughed. Okay, Im either talking about a Pokmon Go guy, or Ted Cruz.